Ruchika Jain, a 25-year old woman from Udaipur has recently successfully completed the Chadar trek, one of the most difficult considered trekking path in the Himayalas. She strongly believes that mundane routine life is not for her. Adventures attracted her from a young age specially trekking on high altitudes had been her passion.The group of 16 people where she was in had all male members except her and she was the only person from Rajasthan. The journey started on January 29 but nine of the team members backed out finding it difficult to brave the challenges that posed before them. The trekkers walked 105 kilometers on the frozen Bakula river situated at an altitude of 11, 150 feet. Walking on the frozen river was like walking on a thin sheet of ice which could break anytime. ” It happened often when we had to walk in knee deep chilling water where the ice had melted. 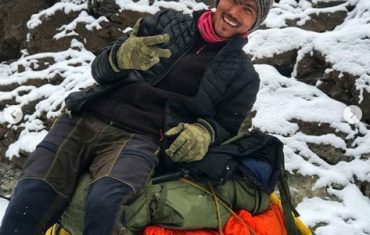 Cold bites and hypothermia were other health risks that involved in the trek but finally all of them were worth taking” claims the young girl. 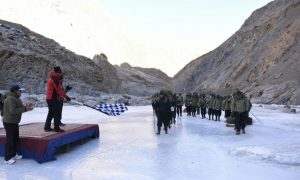 A Chadar Trek Team comprising 27 personnel of the Ladakh Scouts Regiment led by Col Amit Kotnala, Commanding Officer of the 1st Battalion Ladakh Scouts, was flagged off by Major General Arvind Kapoor, Chief of Staff Fire & Fury Corps on behalf of Lt Gen YK Joshi, GOC, Fire and Fury Corps. The team started their trek on 27 January 2019 at 1000hrs, from Chilling, on a four day Trek to Nerak covering a distance of over 70 Kms. 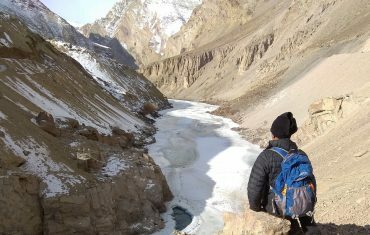 The Trek has been undertaken under the aegis of the Fire & Fury Corps, as an adventure activity for the troops of Ladakh Scouts Regiment, who being the ‘Son of the Soil’, are proficient in ice craft and mountain craft and physically fit to undertake the challenging task. The Team also comprises detachments from other Arms and Services for medical and communication support. 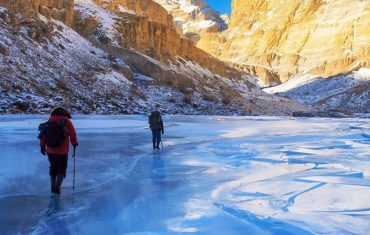 The frozen Zanskar river forms a means of communication between the Indus Valley and the remote Zanskar region which remains cut off from the rest of Ladakh during peak winter season. The frozen water forms a thick sheet of ice known as ‘Chadar’. Besides providing an opportunity to conquer the most inaccessible and formidable route to the Zanskar Valley, the Trek will also infuse a spirit of adventure and accomplishment among the rank and file of Ladakh Scouts Regiment, besides testing their physical and mental endurance to overcome the harsh terrain and climatic conditions.